Water is vital for life on earth, yet millions still do not have access to clean water. Today, 1.8 billion people use a source of drinking water contaminated with faeces, putting them at risk of contracting cholera, dysentery, typhoid and polio. Therefore, we immediately said "Yes, of course!" when we were asked to support and participate in the Walk for Water on World Water Day, March 22. Walk for Water is an initiative truly determined to improve lives by increasing awareness, minimizing wastage, promoting rainwater harvesting and purifying recycled and contaminated water. Together we can save millions of liters and lives. Join the Blue Revolution. 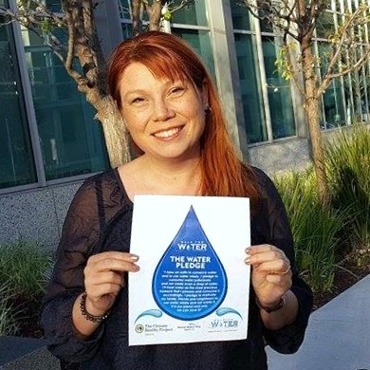 Take the Water Pledge, which is also a 2-minute test of how much water you can save by changing your habits just a teeny bit. Here you can download the blue drop, print it, take a photo and help us spread the Blue Revolution by uploading you picture on social media. Frehwater shortages is quickly becoming an issue in countries traditionally spared. Sweden is one example: this year even more places risk suffering through last year's severe lacks of water on Gotland and Öland. It is upon all of us to take care of our water. Let's use water carefully, let's identify and implement clever solutions, and let's build a global movement of solidarity and crowd wisdom.